Ansonia Clock Co. crystal regulator, "Gonfalon", C. 1906. Came 2 ways, Brazilian Green or white onyx. The top, base and columns are white onyx. We sold a green one in the last auction for $2375, just a little sharper than this one. The brass was polished and had been restored, where the brass parts on our white one has never been polished. We did tighten the case to prevent any breakage of the onyx. I note a couple of places that could be a small break but as I have said repeatedly the veins in onyx many times are misleading and are not actual breaks. All the beveled glasses are good, no chips. The 4" porcelain dial has a faint hairline at numeral one. The hands are original as is the fancy faux mercury pendulum, all in good condition. 8 day movement strikes a standing gong on the half hour and hours. 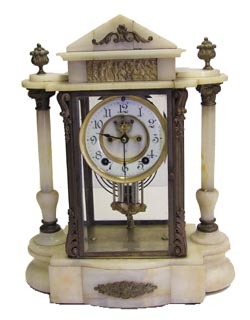 A good cleaning and polishing would make this clock almost as nice as our green one last auction. Refer to our July 2003 catalog, # 83. Ly-Ansonia #409.